Understanding surface or object reflectance is key to designing a building that can be used safely by everyone – including the visually impaired. 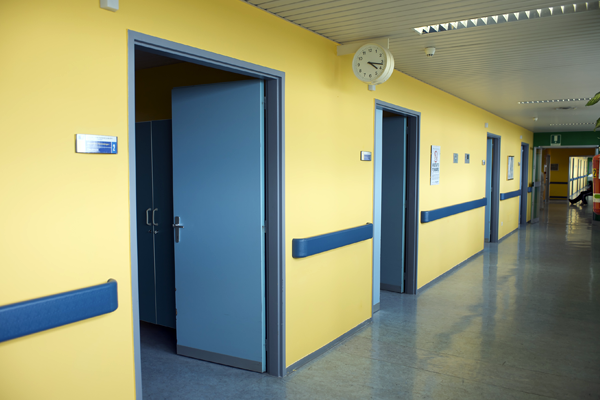 The way in which objects or the differences between surfaces are seen is an important factor when considering the fitting or furnishing of a building – especially as the needs of the visually impaired should be taken into account. Having a good contrast between surfaces and objects (such as doors, door handles, edges of stairs or where there is a change in gradient or surface of floors) can overcome issues that prevent people with a reduced level of eyesight from making full use of buildings and their surroundings (UK Building Regulations Approved Documents M:2015 – 'Access to and use of buildings'). For the visually impaired, it is often the amount of light that the surface or object reflects – the Light Reflectance Value (LRV) relative to its surroundings – that determines whether it can be seen or not. By measuring the LRV of different materials, fixtures and fittings, items can be chosen that give an acceptable contrast. The greater the difference between the LRV of adjacent materials, the more likely the difference in the surfaces will be identified. 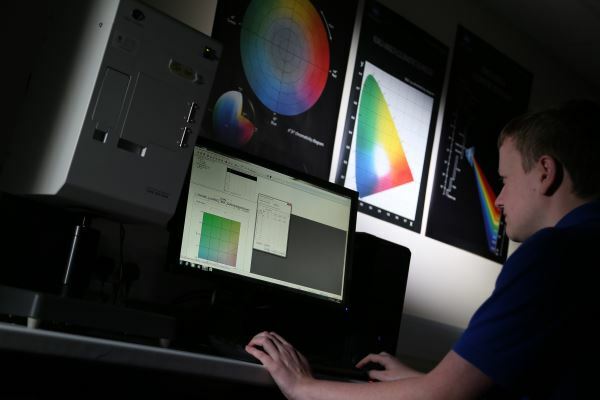 BS 8300:2009+A1:2010 – 'Design of buildings and their approaches to meet the needs of disabled people – Code of practice' provides information on what may be considered as acceptable levels of contrast in light reflectance values. Annex B of this document gives guidance on acceptable LRVs for a range of different situations. A difference in contrasting light reflectance values of 30 points or more is considered as being good. However, a difference of 20 points or more may also be considered as acceptable – especially where the lighting is greater than 200 lux, or for large areas. Values of less than 20 are considered as being poor. When deciding whether a contrast is acceptable or not, consideration also needs to be given on whether the objects are two- or three-dimensional, shiny or matt, and metallic or non-metallic in nature. For instance, a door handle and door may be acceptable with a difference of only 15 points. The higher the value obtained for LRV, the greater the amount of light that is being reflected. A value of 100 represents total reflectance of light by an object (therefore, it appears white) and 0 indicates total absorption of light (black). A number of methods that may be used for determining LRV are also given in BS 8300:2009+A1:2010. BS 8493:2008+A1:2010 – 'Light reflectance value (LRV) of a surface – Method of test', uses the CIE Y, x, y values measured under standard conditions, with a sphere-type spectrophotometer. This method will give an accurate value for the LRV of a material at the point at which it is measured. Hence, where a new material is measured, issues such as fading due to weathering or factors resulting from installation (such as lighting) will not be taken into account. Within BS 8493:2008+A1:2010, the number of measurements taken for an individual specimen is dependent on the sample size. For general surfaces – including carpet specimens – this shall be at least 450mm x 450mm. The sample submitted is divided into a grid and measurements taken at each point where the grid lines cross. 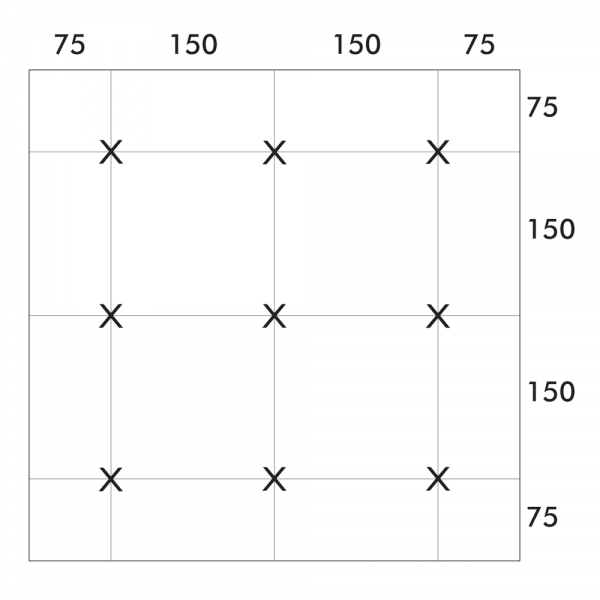 The grid and measurement points for a 450mm x 450mm sample are shown in figure 1 as an example. BS 8493:2008+A1:2010 is applicable to opaque paints and coatings where the surface texture thickness is less than 2mm; opaque coverings such as flooring materials where the texture is less than 2mm; opaque materials such as metallic items where the texture is less than 2mm and opaque materials that have a non-opaque coating or covering (such as a varnish or clear lacquer). It can also be used with multi-coloured surfaces. There are some instances where this method cannot be used, such as with photochromic and fluorescent materials. The use of a hand-held device for the calculation of approximate LRV values may be useful for onsite measurements. Where this is done, the lighting in place at the time measurements are taken may affect the result obtained. As such, details of the lighting should be recorded along with any results for LRV. Colorimeters may also not be suitable for metallic or glossy surfaces, or where the surfaces are curved. It can be possible to use colour swatches with known light reflectance values to approximate a LRV for a material by visual assessment. This is done by simply placing the material in question against a range of materials until a best match is found. As with the use of hand-held devices, the lighting present when the assessment is carried out may have an influence on the result obtained, and so should be recorded. Visual assessment is often the least accurate of the methods described. BS 8300:2009+A1:2010 also includes a table giving the Light Reflectance Values for 100 of the 122 colours listed in BS 4800:2011 – 'Schedule of paint colours for building purposes', which can be useful for an initial selection of materials. SATRA is able to offer testing in accordance with BS 8493:2008+A1:2010. Please email construction@satra.com for further details of this or other services.